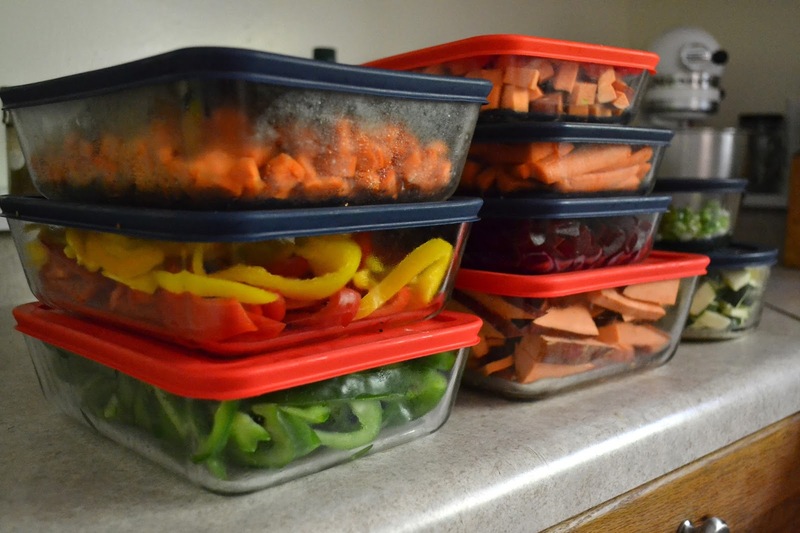 In Austin I had a friend who regularly spent her Saturday or Sunday afternoons prepping meals for the week. She would make muffins, cook and shred a chicken, make a soup, and generally get ready for week's meals. I was always jealous of the outcome, but never motivated to give up a chunk of my weekend to do it myself. Not wanting to put in the time was only part of the reason I never did any meal prep. The main reason I resisted is because I thought I didn't need it. Cooking dinner every night wasn't a burden; I enjoyed it. HP was (and is) interested in the process. At our rental in Austin, he would often stand on his climber and help chop (rather ineffectively, of course), put ingredients in the pot, and stir. I enjoyed spending that time with him and I liked that he saw how our meal was made each night. When he wasn't up for helping he would usually play independently in the living room without (too much) complaint. Some days Neil was even home early enough that he would hang out with HP while I listened to All Things Considered and cooked, which was the best. Enter child number two. What used to feel relaxing and enjoyable has now become stressful. At the end of the day, HP and E are both demanding my attention. Neil usually isn't home until the bulk of the dinner work is already completed. My patience levels when I am not sleeping well (thanks E!) are limited. Not a recipe for a happy household in the hour leading up to dinnertime. It was so worth the few hours it took. I caught up on podcasts while I worked and Neil took the kids out to the park. Meals were a breeze all week long, often requiring no more than ten minutes of hands on time from me. Throughout the day it was easy to reach for a healthy snacks since there were multiple options ready to go. And on Friday, when I just couldn't deal with the world, I pulled out the freezer burritos for dinner. I may not find the time to make it happen every week, but I am going to try. Even I only wash and chop some of the veggies for the meals, it will go a long way toward making the end of the weekdays feel calm and smooth. Well, calmer and smoother anyhow. At this stage, I will take what I can get. Meal prep + podcasts is my love language! Still not quite into a consistent routine since Cedric but hopefully as he is more independent and when the weather is nicer Chris can take them to the park. Can't wait! I hope it happens for you soon! Lately E has been feeling so "old" to me even though she's obviously still a baby. She has changed so much in just the last couple of months. Tonight I am making a double batch of the lentil soup recipe you posted awhile back and freezing half. A high-five to my future self as you would say! Hi! Will you please post some of your vegetarian recipes at some point? I miss eating your healthy food! You are way better at fitting in veggies than I am. I can try, but I am no food blogger... I've been trying to fit in a lot of veggies as snacks (carrots, bell peppers, green beans, beets) to up my intake. We are big into one-pot meals around here so I almost never do "sides" that are vegetables. The meal prep is definitely helping us make the best use of produce throughout the week (both as snacks and in the meals themselves). If I don't do a post I'll just email you some of our favorites.